Set along the beautiful waters of the Gulf of California, near the edge of Chileno Beach, Grand Velas Los Cabos is a haven on the tip of the Baja Peninsula. Channel the environment's energy, and embrace serenity in epic surroundings. Perched over the pristine white sand beaches of Playa del Carmen on Mexico's Caribbean Coast, Grand Velas Riviera Maya is an all-inclusive vacation paradise. This inspiring resort offers ocean and jungle view suites, a wellness spa, private beach, gourmet dining, fitness club, convention center, and butler service. Lounge by the infinity pool, soak up the sun, and indulge at fine restaurants. Discover beautiful Caribbean waters, jungles, Mayan ruins and the wonders of Tulum and Cozumel. Hugging Banderas Bay in Nuevo Vallarta, Grand Velas Riviera Nayarit is an all-inclusive resort that elevates the senses. Unwind in ocean view suites, sample gourmet dining, take in ocean vistas, replenish at the spa, and tee off on fairways in a gorgeous Puerto Vallarta setting. Try artfully crafted cuisine at unique restaurants, swim up to the Aqua Bar, scuba dive, and dance at a fiesta. Recipient of Conde Nasts' "Most Excellent Spa Hotel" award, our Riviera Nayarit resort rejuvenates the spirit. Celebrate your wedding in Puerto Vallarta/Riviera Nayarit, the Riviera Maya and Los Cabos - the most beautiful and romantic wedding destinations in Mexico. From the sacred scenery of the Riviera Maya to the beaches of Puerto Vallarta and the impressive rock formations and azure seas of Los Cabos, Mexico is an enchanting destination for exchanging your weddings vows and enjoying a romantic honeymoon. Velas Resorts bring friends and family together to celebrate in tropical gardens, pristine beaches and elegant wedding venues throughout Mexico. Experience a sunset wedding on a peaceful Pacific, Caribbean or Baja California beach as the sounds of the infinite sea create a symphony of romance. Our luxurious resorts in Puerto Vallarta, the Riviera Maya and Los Cabos are captivating destinations to celebrate your wedding moments. Envision your dream day at Grand Velas Los Cabos, and say your vows surrounded by shimmering sands and sparkling azure waters. Select from venues ranging from elegant ballrooms to our oceanfront terrace and beach location. Our expert planners will help you create a spectacular event with chic décor and fragrant flowers, and our world-class chefs and mixologists will work with you to create a menu of memorable dishes and creative cocktails. Prepare for the big day with professional hair and makeup in our Spa nuptial suite, and allow yourself to be swept away by panoramic ocean views and the many special extras included in our wedding packages. 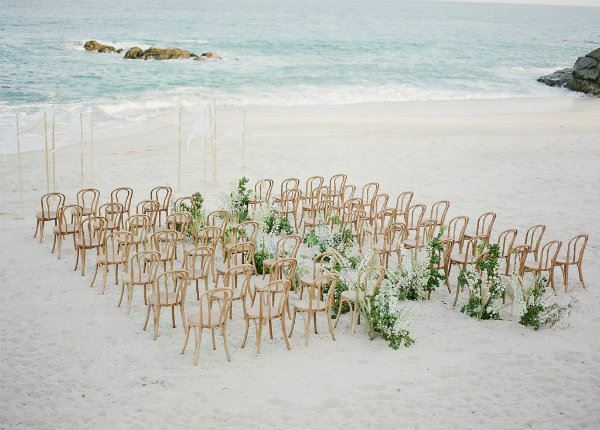 Experience the wedding of your dreams at a luxurious resort in Riviera Maya. 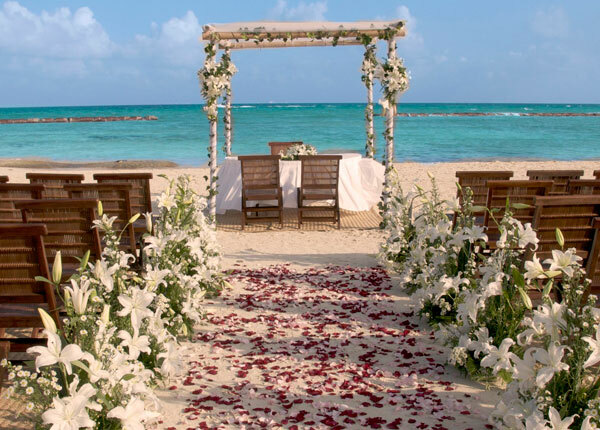 Grand Velas Riviera Maya offers a spectacular backdrop for walking down the aisle in view of the ocean, as well as elegant event space and a grand ballroom for unforgettable wedding receptions - intimate or grand. Count on our professional planning team to help with every detail and coordinate wedding services, from catering to photographers, and select from our Riviera Maya wedding experiences for the beach ceremony of a lifetime. 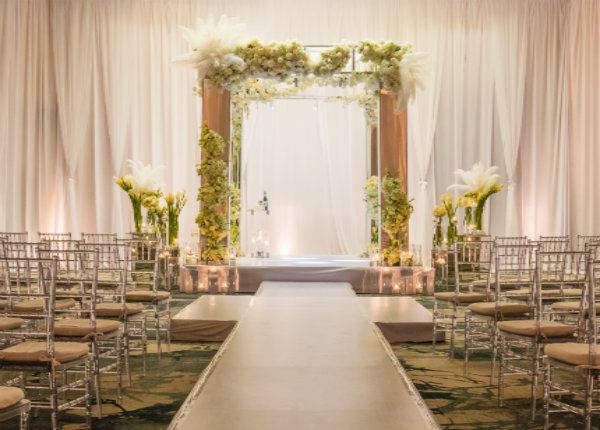 Whether picturing a sunset beach wedding, a romantic garden celebration, or a chic ballroom affair, Grand Velas will deliver the wedding of your dreams in high style. Our Riviera Nayarit resort offers beautiful indoor and outdoor venues, exceptional catering and Five Diamond banquet service. Custom menus and a range of services - from photography to flowers to music complete the experience. Celebrate your dream day with our all-inclusive packages, and capture your perfect moment by the sea.